18-year-old Jake Hastie started the season in a difficult position, with game time in Stephen Craigan’s high-flying U20s side fairly limited. But in the past number of weeks, the midfielder has looked like a new player completely. An electric threat going forward, Hastie has repaid his managers faith in him by becoming one of the standout players in the squad. Scoring and assisting on a regular basis, the winger’s form was rewarded with a call-up to the first-team and a substitute appearance at Parkhead, as Mark McGhee’s side lost 2-0 to the Scottish Champions, but the youngster and his older teammates put in a strong, formidable performance. The 18-year-old’s efforts didn’t go unnoticed by neither McGhee or Craigan, with both managers touching on the wingers form and work-rate. Mark McGhee said: “Ross MacLean, David Ferguson, Jack McMillan and Jake Hastie acquitted themselves brilliantly. Stephen Craigan has overseen the youngster return to the U20s starting line-up and admitted he has really enjoyed watching him play. He added: “Jake has trained really well and I said to him a few weeks ago that I was really enjoying watching him training and I couldn’t wait to see him playing again and now he’s reaping the rewards of working hard and keeping his head down. Jake himself is enjoying his football and he’s hoping that his good run can continue. He added: “Playing under Stephen Craigan in the U20s has taught me a lot and coming on at Parkhead was an unforgettable moment for me. 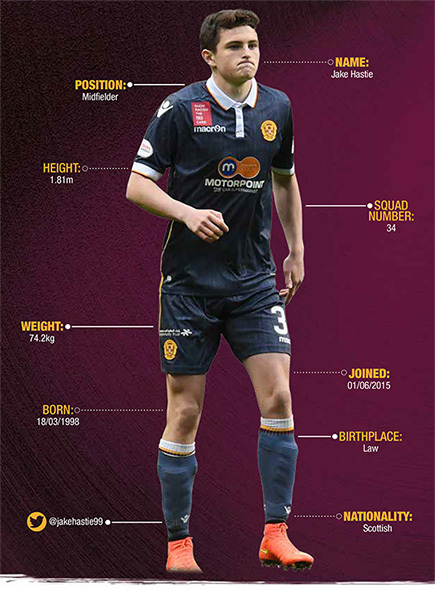 With a strong attitude and an ability to match, Jake Hastie is a name that may become familiar among Motherwell fans sooner rather than later. Extended highlights from Excelsior Stadium as Robbie Muirhead’s first-half strike consigns the Under 20s to a 0-1 defeat to Hearts. U20s boss Stephen Craigan felt his side weren’t ruthless enough as they lost 1-0 at home to Hearts in the Development League tonight. A goal from Robbie Muirhead was enough for the visitors, who named an experience side, to claim all three points at a chilly Excelsior Stadium. And speaking to MFC TV after the match, the Northern Irishman admitted his side started on the front foot but fell away as the match progressed. He said: “I think the longer the game went on the less likely we looked to get back into it. I think the first 20 minutes we started really, really well – we were positive in midfield, our movement was good and I thought we moved the ball well and created chances. Former Killie man Muirhead put Hearts in front after a long ball from Alim Öztürk cleared the Motherwell defence and the forward coolly finished past young keeper Jordan Pettigrew. Craigan admitted that he was disappointed to see the pass trouble his side. He said: “After about 20, 25 minutes the game became quite even and they came at us a bit more before scoring their goal which came from a hopeful ball of the park. “I know it was a decent pass from Öztürk but when someone’s playing the ball 70 yards it can’t be causing us the problems it did. Hearts fielded a number of experienced players, but that didn’t bother Craigan, who prefers his youngsters to be tested against as high a standard of opposition as possible. He said: “I prefer the kids to play against the older players, I think it tests them and a few of the youngsters showed tonight that they still have work to do to improve their game and against an experienced side you have to take your chances. A frustrating night ended in defeat for Motherwell U20s who went down 0-1 to an experienced Hearts this evening. The Steelmen controlled much of the match but let themselves down by poor final balls and were frustrated with numerous blocked shots by a resolute and stubborn Jambos rearguard. In the end, it was a Robbie Muirhead goal eight minutes before the half-time interval that separated the sides at a bitterly cold Excelsior Stadium. The Steelmen named a young side with the only over-agers being 20-year olds Dom Thomas and David Ferguson. Hearts on the other hand were able to name five over-age players, including well-known names such as Alim Öztürk, Juwon Oshaniwa and the aforementioned Muirhead. Despite the gulf in experience, it was the young Claret and Amber men who started the game bright with a Thomas free-kick sailing over after just three minutes before the same player had a positive run and shot saved by Swedish International cap Viktor Noring. A minute later and ‘Well would have an even better chance to score when they were awarded a penalty. A corner from Jake Hastie flew towards the back post and when Leon Jones wrestled David Ferguson to the ground, referee Garry Doherty pointed to the spot. Dylan Mackin stepped up only for Noring to comfortably save and hold his nonchalant effort. Thomas had another shot from distance comfortably saved by Noring before Hearts registered their first effort when Öztürk’s long, searching pass found Oshaniwa who turned inside Watt before striking a low shot that was well held by young debutant Jordan Pettigrew. Noring made another two saves from distance, one from Thomas that was comfortably plucked out the air, the other from Mackin whose bouncing effort was a little more difficult to handle, but the former Trelleborgs and Heerenveen stopper was again up to the task. Hearts started to settle into the game and Muirhead, booked moments before for petulance, fired a warning shot across that bow with an effort that forced Pettigrew to stop. It was a warning the Fir Parkers failed to heed as with their next attack five minutes later, the Jambos pinched the game’s only goal. A long, hopeful looking punt up the park from Öztürk had Muirhead in behind the ‘Well defence. The big striker kept his composure to comfortably tuck a shot under the outrushing Pettigrew and into the back of the net. Incredibly, from being second best for most of the half, Hearts almost doubled their advantage seconds later. Again it was Muirhead, again it came from a direct ball, but this time the former Killie man was denied by a magnificent finger-tip save from Pettigrew, who turned his curling shot onto the post before bouncing clear. Despite the setback, half-time would allow Craigan to try and regroup and they came out the traps with fire in their belly at the start of the second period. Midfielder Allan Campbell would have a couple of early efforts from the edge of the area, the first blocked on route, the second pulled wide of target. Then, three minutes later, slack play from Hearts allowed Thomas time and space to run at the visiting defence. Cutting in onto his left foot his shot looked to be troubling Noring, but yet another decisive block denied Motherwell, this time former Polish U21 stopper Krystian Nowak did enough. Hearts first opening of the second half fell to Muirhead, but his half-volley on the spin bounced five or six yards wide of Pettigrew’s post. Motherwell were in control of possession though and always looked the most likely, albeit repeatedly failing to pick out a man with the final ball was a constant source of frustration for ‘Well boss Craigan. Although, they did get through with some impressive link play between Thomas and Mackin, the latter slipping a nice ball into the path of the supporting Turnbull, who found himself one on one with Noring. However, the big keeper stood up well and saved the low shot with his feet at the expense of a corner. Thomas had another close shave, with a fired low effort again blocked by Nowak before Mackin brought out another decent catch from Noring, when he got on the end of a Hastie cross, only to watch his looping header saved by Hearts number one. Hearts rarely troubled ‘Well in the final third, but almost wrapped up the game with a stunning 40-yard volley from Nowak that only just sailed wide of Pettigrew’s post. Instead, it was left to ‘Well to push in the final ten, but the closest they could muster was yet another blocked effort, this time when Luke Watt danced around a couple of challenges, only to see his low shot again blocked by the sliding Hearts defence. Motherwell fans have the chance to save as much as 50% on match tickets with the clubs all-new Flexi Tickets. Sunday saw the launch of this season’s new packages, with ten game and five game options available for the remaining fixtures in the Ladbrokes Premiership season – including matches against Celtic, Rangers, Hamilton, Hearts and Aberdeen. Marketing and Fan Engagement Manager Ryan Murrant believes it is an ideal money-saving choice for ‘Well fans. He said: “This is a great option for fans who maybe missed or couldn’t commit to a season ticket at the start of the season. The packages replace the season and half-season tickets for the remainder of the 16/17 campaign. A 10 game Flexi-ticket is available from as little as £168, which works out at just over £16 per match and with a 5 game option from as little as £84. Juvenile Flexi-tickets offer the chance to save an impressive 50% on ticket prices. When buying either package, you will receive a voucher printed with a barcode which when scanned at our ticket office, will entitle you to receive the match tickets you require. If you already know which games you want to attend then when buying the package, you can take home the tickets right there and then! Alternatively, on the day of each game simply pop into our ticket office to have your voucher scanned and receive your match day ticket. Please note that Flexi-ticket vouchers can only be redeemed at the ticket office – please collect your ticket before 2.30pm (7.15pm for evening games) on match days. The Flexi-Tickets allow you to take advantage of all remaining MFC 2016/17 Ladbrokes Premiership home matches, tickets for other MFC games can be bought separately. *Please note, concessions are applicable to over 60s, full-time students with a valid matriculation card and, for the first time ever, 16 to 18 year olds. ‘Juvenile’ age of Under 16 is applicable as at 1st August 2016. Motherwell U20s return to action tomorrow evening in the Development League with a clash against Hearts at the Excelsior stadium. After getting their Scottish FA Youth Cup defence off to a successful start on Sunday morning with a 1-0 win over Cumbernauld Colts, the youngsters have a chance to string together their third consecutive victory in all competitions. There is further motivation for Craigan’s side given the fact that a win could potentially see them go top of the Development League table. Last week, the Steelmen overcame Partick Thistle at Firhill which saw them move to third in the table. Goals from Dylan Mackin and Jake Hastie secured the victory in what was an extremely entertaining fixture. After the match, Craigan spoke to MFC TV and said: “First and foremost I want to say what a great game that was – I really, really enjoyed watching that. That pulsating performance was not on show on Sunday however, with the manager expressing his disappointment at the final whistle despite progressing to the next round of the cup they held aloft last season. The manager expressed his desire for more from his side, and said: “I’m probably disappointed more than anything because I think we’re better than that. If that was the first time you came to see our U20s play you’d probably think that they’re not as impressive as people say. Tomorrow’s opponents Hearts currently sit second bottom in 16th but come in to the match on the back of a 2-1 win over Dundee and three points tomorrow could see the Edinburgh side climb as high as eleventh. The match kicks-off tomorrow evening at the Excelsior Stadium at 6pm. Motherwell FC is today delighted to announce the renaming of the East Stand to the John Hunter Stand, in tribute to the club’s legendary former league-winning manager. John Hunter, or ‘Sailor’ as he was commonly referred to, was a centre forward whose playing career saw him cross the border on several occasions. He was a member of the first Liverpool team to win the title in 1900/01, and also had spells at (Woolwich) Arsenal and Portsmouth. In Scotland he played for Abercorn, Hearts and Dundee. Latterly, he signed for Clyde, but had to retire having never played for them due to injury. Hunter went into management early and was appointed secretary-manager of Motherwell in 1911 – aged just 32. He presided over the most consistent and successful spell in the club’s history when, between 1926 and 1934, the Steelmen never failed to finish outside the top three. He was one of the first managers to take his team abroad and they enjoyed a very successful tour of Spain in 1927, winning six out of the eight games they played and losing only one. These results included an emphatic 3-1 victory over Real Madrid and a 2-2 draw with Barcelona. He also pioneered several other tours to South America and South Africa, a real first for the time. However, his crowning achievement undoubtedly came when Motherwell won the league title in 1931/32 with 30 wins in 38 fixtures, scoring 119 goals – a record 52 of which were scored by Willie MacFadyen. The was the only and only time the Steelmen have been Champions of Scotland! Hunter also led the club to three Scottish Cup finals in 1931, 1933 and 1939 but they were defeated on all three occasions. He eventually stepped down as manager after the Second World War in 1946 but remained at the club as secretary, during which time he played a pivotal role as ‘Well lifted the League Cup in 1950 and the Scottish Cup in 1952 for the first time. He eventually retired in 1959 after an astonishing 48-year association with Motherwell Football Club. John died in the town aged 87, back in 1966, and to mark the fiftieth year since his passing, the club is honouring arguably its greatest ever son with the renaming of our iconic home stand. Chief Operating Officer Alan Burrows said: “We currently honour and remember a number of our legends from yesteryear with the Joe Wark Lounge, the Phil O’Donnell & Davie Cooper Stands and the Martis, Weir, Humphrey and Paton Boxes in the South Stand. “In future years, we want young fans to ask who John Hunter was so his incomparable half-century contribution to Motherwell FC and the amazing story can be kept alive and well for every generation. “We will rebrand the side of the stand, renovate the entrance way and will dot little facts and figures about Sailor’s achievements around the stand, so people know exactly what this true great management to accomplish whilst in charge of our club. With over fifteen years of service and captaining the Steelmen to both League Cup and Scottish Cup success, it seems easy to see why in 2006 Andy Paton was voted the club’s ‘Greatest Ever Player’ by Motherwell fans. But what makes the award all the more special however is that even though by then Paton’s boots had been hung-up for almost half-a-century, such was his reputation that many supporters who hadn’t seen him play in the flesh were still moved to vote for him. Signed from Kello Rovers during season 1942’43, Paton had impressed Motherwell manager John ‘Sailor’ Hunter whilst on trial. Every inch a true “footballer”, Andy gained notoriety for his point blank refusal to adopt a safety-first approach to defending. It simply wasn’t his style to clear the ball to touch or as far up the park as possible. Sure, he could be firm in the challenge when required but Paton adopted a more cultured approach to the game where his dribbling and passing skill came to the fore. In 1950 Andy would captain Motherwell to their first, and thus far only League Cup success, after Hibernian were beaten 3-0 at Hampden. The sight of Paton, carried shoulder high, by his team-mates with the trophy aloft would become one of the most iconic images of the club’s history. There was further glory to follow in 1952 when Motherwell finally shook off their Scottish Cup hoodoo to win the trophy for the first time by dispatching Dundee 4-0. Full international caps would soon follow against Sweden and Denmark. After a shock demotion in 1953 Paton helped Motherwell to an immediate return to the top flight in 1954 and such was his influence that whilst very much in the veteran stage of his career he won the first ever Player of the Year award which Motherwell issued in 1956. Andy’s ‘Well career, more spanning more than 500 games, reached its conclusion in 1958 when he moved on to Hamilton. 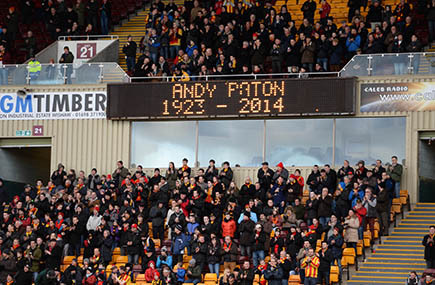 It was with great sadness Andy’s passing was recorded in February 2014. His legend however lives on. Extended highlights from this morning’s 1-0 win over Cumbernauld Colts in the Youth Cup.